This dress is has a beaded bodice, with silver threading. With 7 layers of tulle, it gives a beautiful silhouette. The top layer is a sparkly layover that in the sun glistens beautifully. The details on the beading are unique as well as a mixture of beads, crystals and sequins. It also has the capability of being bustled. This is truly a "Princess Dress." 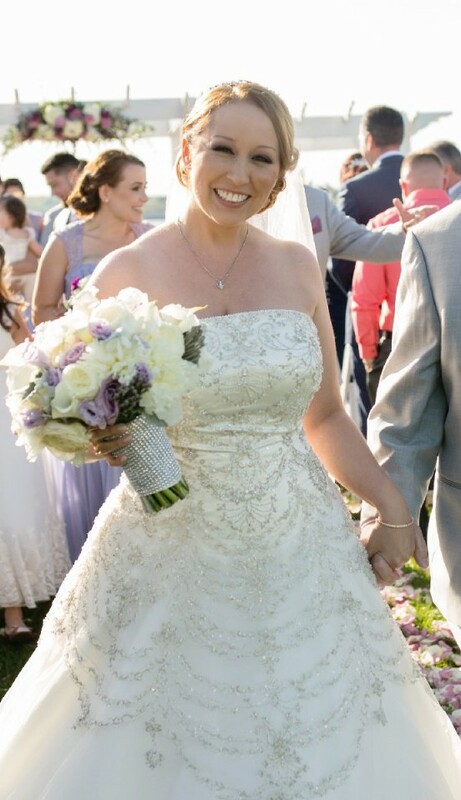 I received so so many compliments on this dress, that to this day I still am told how beautiful my dress was, and I was married almost 2 years ago! I can't exhaust enough how DETAILED the beading is on this dress, and is what makes it so unique. 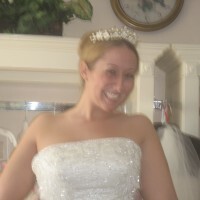 I also have a veil, tiara and clutch that match the dress perfctly if interested, we can bundle! It was hemmed, I am 5'4, but I wore very low heals, as pictured. And the bodice was taked in.